Among the Marché Central's colors and fresh smells of fruits and vegetables, Hamza Ayari sets up, on an average day, about 10 portraits. He invites some people as they shop near his stand; others have heard about his photography either by word of mouth or through local media, and they seek him out. Among the visitors to his stall was a middle-aged German photography enthusiast who introduced himself as Norman. He would come by to talk about their shared passion for photography, says Ayari. “Norman was surprised I could take so many pictures with such a small camera,” Ayari explains. Then one day about 10 years ago, Norman showed up with a present: a Nikon D80 camera. Ayari recalls the moment as one of great surprise, happiness and a sense of profound luck: He could now take his hobby toward a professional level. He taught himself to use the camera by experimenting with every setting and button. Each day he brought it to the market, wrapped in a cloth for want of a camera case. He carried it with him everywhere. “I was crazy for taking pictures,” he says. He worked seven days a week, and although this afforded few opportunities to explore beyond the market, the city came to him. 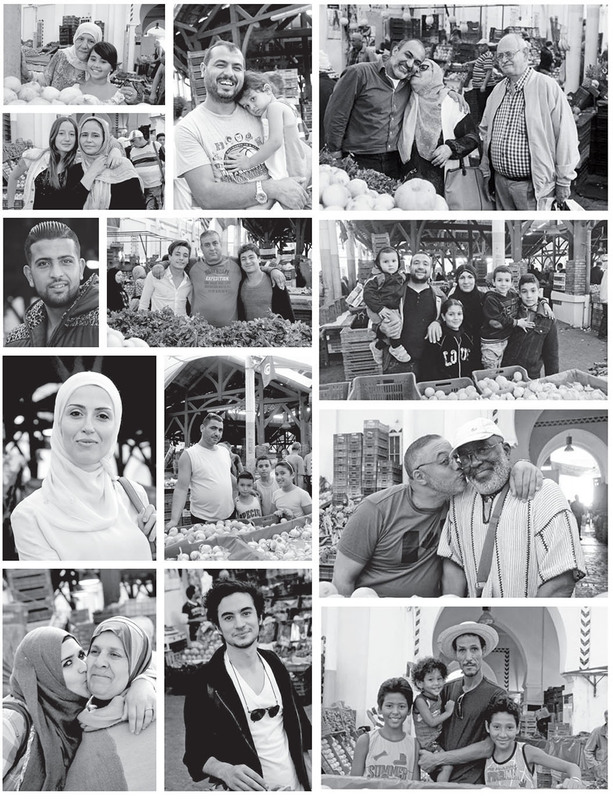 In the market, he says, he could find the heart of Tunis in the faces of pensioners, professors and bankers; singers, seamstresses and mechanics; cooks, homemakers and children on errands. He captured them all. 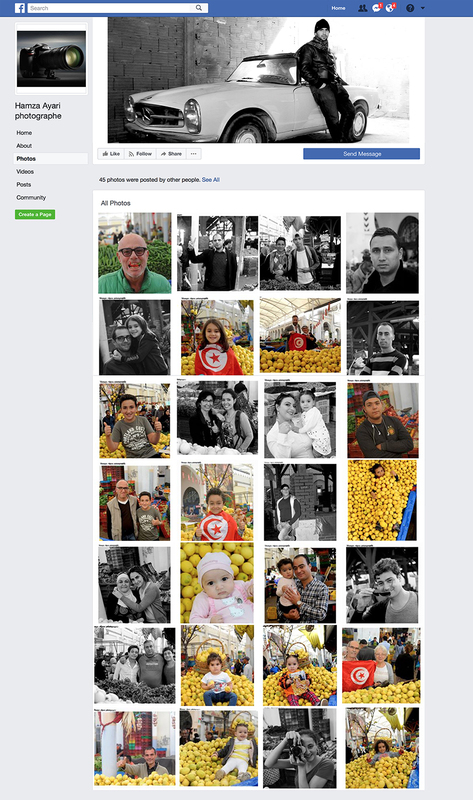 As word spread, people began coming to the market not for produce at all, but for a portrait. Younger photographers began to hang around, too, and they would pepper him with questions. He always made the portraits requested, and he answered every question. Two years later Norman was back. “He asked if he could use the camera for a few days,” Ayari recalls. “When he returned, he said he was impressed with how well I had taken care of it and how much I had used it.” Norman, it turned out, had brought another gift. This time it was Nikon’s professional D700 camera with a pair of high-quality lenses. “It was another joy and a surprise,” Ayari says, deeply aware of his continuing fortune. “I know a lot of photographers, and no one gives you a gift like that.” As with his other cameras, he keeps it under the counter of his stall, and every day he uses it to make photos of people. In 2013 a Tunisian television channel ran a 20-minute feature on Ayari. This brought people to the market even from beyond Tunis, just to have a portrait made by “al-mosawer baye’ al-limoun.” At the end of that year, he held an exhibition—fittingly in the Marché Central itself. In his portraits, people are noticeably relaxed. Although some know Ayari from years in the market, many do not, and as a Marché Central professional, Ayari has cultivated a breezy confidence with strangers. They trust him and follow his posing directions, and it all shows in the images. Since the 2011 Tunisian Revolution, Ayari has kept a flag in his stall, often draping it around the shoulders of kids. “It was a way to show pride in being Tunisian,” he says. In the 1995 movie Smoke, a character named Auggie Wren, played by actor Harvey Keitel, works in a Brooklyn tobacco shop and each day takes photos from the same spot. Not “just some guy who pushes coins across the counter,” says Wren, photography is “my project—what you’d call my life’s work.” In the film, Wren points to 4,000 photos stuck into 14 albums. Ayari has gathered more than 5,000 followers on Facebook, and his page has become a gallery of the playful, unguarded exchanges between his subjects and his camera. 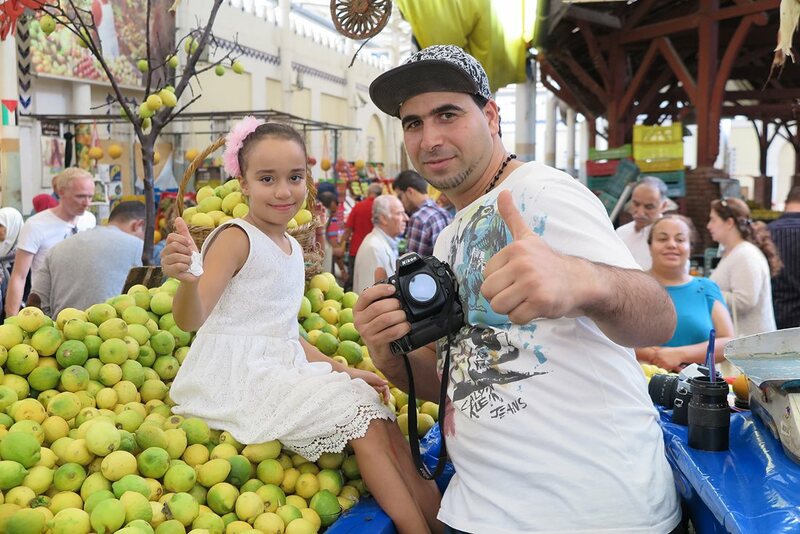 Some of his favorite subjects are children, whom he often poses atop, and sometimes amid, piles of lemons and, at other times, with aTunisian flag. Unlike the fictional Auggie Wren, Ayari does not shut away his prints in albums. Before he received his first Nikon, he had begun printing the portraits using money earned by selling mint and giving them to the people he photographed, often during the three days of ‘Id al-Fitr that mark the end of Ramadan. “At least 500 a year,” he says. He adds that when he was young, receiving a photo of himself gave him a warm and contented feeling. Now giving them to others is a similar pleasure. Perhaps also it is a subconscious way of passing on Norman’s generosity. Ayari never even learned Norman’s surname, he says. He has not seen him for several years. On a Saturday morning in October, Ayari was in his usual place, bantering with familiar faces, weighing lemons, selling brilliant green mint by the handful and dropping Tunisian dinar coins into a wooden box of change. A couple approached, their 10-year-old daughter somewhat reluctantly in tow. Ayari smiled and spoke a few words to her, and the girl’s apprehension seemed to evaporate. He moved some lemons aside to make a space on the mound for her to sit. He then lifted her up, smoothed out her white dress, adjusted her pink feather hairband and gave her some directions on turning before clicking off a couple of frames. After he showed the girl and her parents the results on the camera’s back screen, he slipped the camera back under the counter. They would have their pictures soon enough, he assured them, as a lemon-buying customer was waiting. He started to gather up her order. Ayari’s aspiration, he says, is to help promote awareness of photography as art in Tunisia. “I want to spread it around the country. This is my dream,” he says.